I was taking pictures of a yellow jacket eating an aphid (see slide show at www.kittykono.com) when I heard a loud squawking. 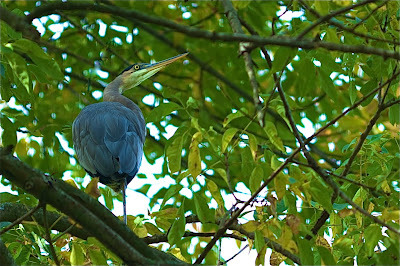 I looked up and saw a great blue heron rise up from the pond and land way up in a tree. I didn't have the right lens, but still thought I would try to capture this beauty. She was a good 40 feet up and camouflaged by the leaves. My only shot was straight up. (You can see her looking down at me with two eyes if you click on the first photo.) I got a few pictures and kept clicking until the old girl decided she didn't like the camera. Right then and there she went to the ladies room as the camera clicked away. I had just a second to duck. Lucky me. 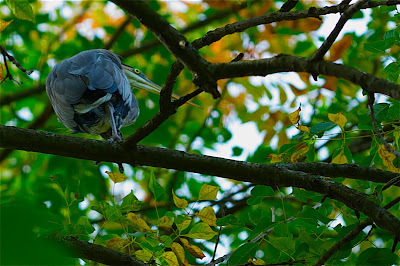 Lovely bird.